FLORENCE, WI– It’s often said that while glancing down to send a text message while driving, you travel the length of a football field – blind. Florence, Wisconsin High/Middle School, in conjunction with AAA, AT&T, and the Wisconsin State Police, held an assembly this morning to highlight the importance of stopping distracted driving to reduce the number of traffic accidents nationwide. New research released by AT&T shows that 81% of people admitted to texting while driving, while 64% have admitted to ‘snap-chatting’ or looking at photos – the statistics are staggering. About 175 students at the school learned about the dangers of smartphone activities while driving during the ‘It Can Wait’ presentation. Besides the assembly, the school district says they are using new means to reach out to students and caution them regarding distracted driving, whether it involves technology or not. “[We use] persistent messaging through our driver’s education program, and cooperation with our local sheriff’s department in Florence County, but I think with social media, there’s a lot of messaging we’re passing on to our students, because we have to keep driving this message into them,” said Florence County School District Administrator, Ben Niehaus. 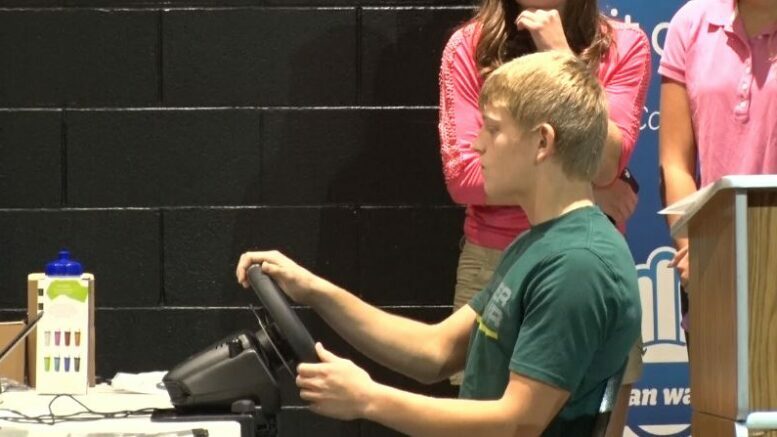 Triple A wanted to give students a hands-on approach when it comes to teaching about proper safety behind the wheel, and brought along new technology that allows students to experience the dangers for themselves in a virtual setting. The differences between focused and distracted driving were made clear. Students were encouraged to sign a pledge to keep their eyes on the road and not on their phones, and be a part of the ‘It Can Wait’ movement.